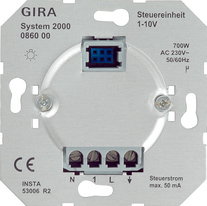 1 – 10 V control unit for switching and dimming electronic ballasts or Gira Tronic transformers with 1 – 10 V interface. Saving of a switch-on dimming value (also using auxiliary unit). Double-surface operation: Briefly pressing the button switches the light on. Pressing and holding the button at the top or bottom rocker half dims the lighting or makes it brighter. Electronic ballasts generate very high current spikes. For this reason, use a switch-on current limiter or a separate load contact for with greater loads.